Stuffed cabbage rolls make a delicious dish for the colder months! In the Middle East they are often eaten garnished with pomegranate molasses, with some roast meat on the side. Some people like to eat them as they are; others like them with Arabic flatbread or sliced potatoes. In some houses this recipe is prepared together with other stuffed vegetable dishes, such as yabrak or stuffed courgette. We hope you enjoy trying this recipe! 1. Blanch the cabbage leaves in salted boiling water for several minutes until very tender. Drain in a colander and then cut them in 5 inch squares. Reserve the thick stalks. 2. Soak the rice for 15 minutes in water, drain and mix with the ground meat, salt and white pepper. 3. Chop the onion fine and fry gently in olive oil till softened; mash 8 cloves of garlic with some salt in a mortar coarsely and add to the chopped onion. Add the dried mint and fry this pesto for a few seconds until fragrant. Transfer to the bottom of the pot in which the cabbage leaves will cook; top with the cabbage stalks spreading them to cover the bottom of the pan. 4. Flatten each cabbage square and place a generous tablespoon of stuffing on the edge of it; roll up like a cigar, leaving the ends open. Try not to place stuffing towards the ends as the stuffing will expand during cooking. 5. Place the cabbage cigars one by one in the pot; place a small plate on top of the cigars to hold them in place if desired. 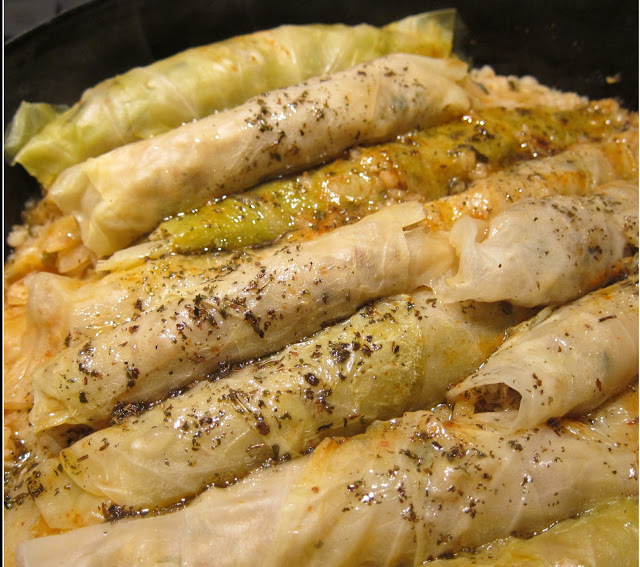 Place the remaining garlic cloves (peeled but whole) in-between the cabbage rolls. Add the meat stock, the lemon juice and the rest of the olive oil as well. Cook for about one hour over low heat at a gentle simmer until the stuffing is thoroughly cooked and the leaves are extra tender. Serve warm. 6. NOTE: In the olden days, fat was added to the meat for extra flavor and moisture; for expediency, I would simply use a ground meat at 85%.